Artist Janet Laurence’s multi-species survey exhibition has now launched at the Museum of Contemporary Art, Sydney. Having exhibited work for over thirty years, Laurence presents a kind of secret charm that is difficult to define. It’s a combination of serious earnestness, childlike joy and fearful knowing. By this I mean that she has read the science statistics, seen the climate change data, visited the at-risk habitats and met the endangered species first-hand. Nature is in trouble. For me, Laurence does not attempt to out-run climate change fatigue but allows her artwork to ‘sit with’ it. As the result of this, along with more than a few conversations with the artist, and having spent some time in the new MCA installation, ‘Theatre of Trees’ (2019), I suggest that the following three categories are critical to the success of her artwork. Janet Laurence’s installations are often accompanied by videos or recordings of endangered animals and birds. These comprise scrabbling sounds in the bush or the squawk of animal cries or the melodious tunes of birdsong. In her MCA exhibition, the call of the endangered black cockatoo echoes across the entire museum floor. Various projections accompany the installations, where further nature-sounds emit from film excerpts. The result is a cacophony of natural sound in the unnatural environs of the white-walled museum. There is much discussion now about the language of plants—the way plants communicate with one another via gases or chemicals. Linguists and plant philosophers grapple over whether we can come up with a new way of speaking about plants and other natural life that is true to their species. Can humans decide upon a new lexicon about plants, that matches plant life, for instance? Many of us who peruse these things find ourselves at a dead end. Over and over. Why? Because we are stuck in our humanness and every word we utter, every gesture we communicate, will be trapped in being inescapably human. Laurence, however, is the only one in our plant-obsessed academic community who achieves something different. Rather than speaking a new plant-appropriate language, her work presents as a mediation: not so much a translation, as a visual transcription of plant activity. Laurence has always been fascinated by geology—rocks, gems and myriad minerals. She likens the changeable process of mixing paint (a concoction of earthy minerals in itself) and the process of painting on many of her artworks and installations, to alchemy. The secret art of alchemy refers to purifying and changing the form of objects. This is evident in her current MCA exhibition, as several works re-present the turning of base metals into gold. There are sheets of metal and specimens of rock and changed alloys. All these artworks that comprise earth elements and potions represent her yearning, like so many alchemists before her, for a special elixir. The secret to all life? Perhaps this will also give us the key to, or solution for, extinction. This kind of searching, through her art, is in the tradition of 18th century physicist Isaac Newton and even of 18th century plant writer Goethe. In essence, it reflects a lively desire to stumble upon fundamental form, the secret template to how all life is made. For an artist, this is key—the drive to create. For an environmentalist, another key—the drive to survive. Laurence does not stop there. 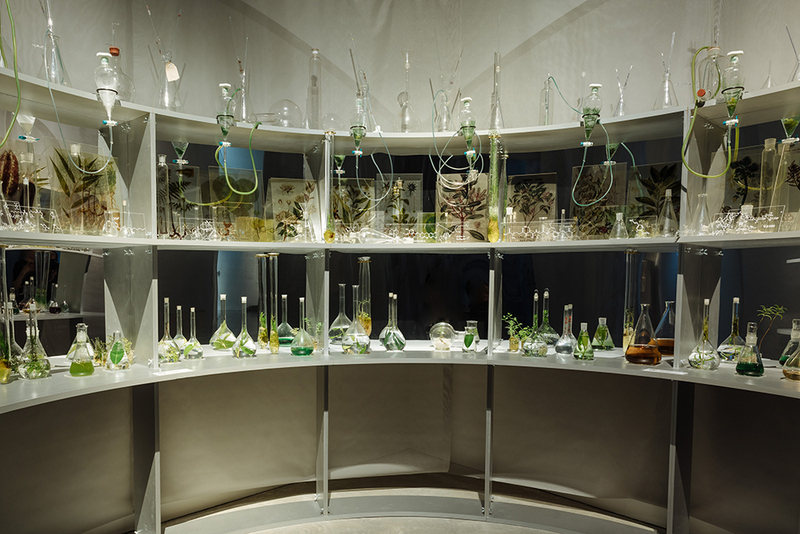 In Germany, Japan and Sydney, the artist has exhibited her ‘Elixir Bar’, where she researches and mixes plant-derived potions, secret elixirs that might change your mind. This is the job of art: to change form, including that of the viewer. Incantations, spells, potions…these are implicit in the elixir bars and the metallurgy artworks, and are suggestive of the way in which humans are only one part of planet Earth. Humans are complicit in the demise of the earth’s surface and are present in the scaffolding of Laurence’s artworks. There is not a single artwork in her exhibition that does not implicitly or explicitly refer to the danger of human-caused extinction. Her black cockatoo squawks its endangered siren call. The taxidermy creatures and the abundant sea specimens, made timeless in their jars of formaldehyde, all refer to the marching threat of habitat loss. 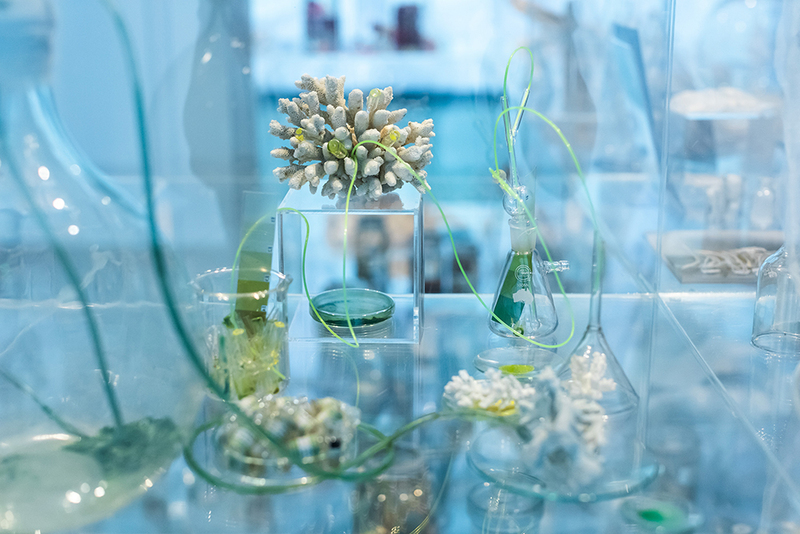 In Deep Breathing: Resuscitation for the Reef (2015-16/2019), the artist creates small perspex wards of a hospital, where natural specimens are hooked up to medical tubing or red thread, connoting blood transfusions. This is Laurence’s aesthetics of cure, where she references data on extinction and endangerment, on habitat loss and bio-diverse species depletion, and yet, she still maintains her intrinsic character of hope. She has hope that governments will step up, that communities will change accordingly, that species can be restored. Many of Laurence’s artworks will endure because they have been acquired by various museums. Imagine a future, let’s say in 2090. 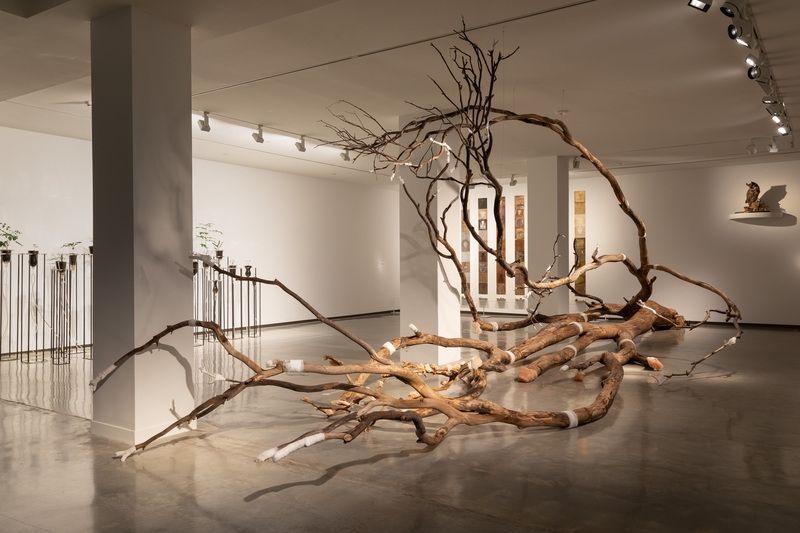 Audiences will come to the MCA to view her artwork ‘Theatre of Trees’ and pause to consider how closely humanity shaved extinction back in 2019. These future audiences will be safe in the knowledge that the earth survived, because we did something about energy and environment care just in the nick of time. Imagine that! I believe that is exactly what Laurence imagines, hopes for and asks of us.